Here I’d like to explore some of the meetings between Europeans and Australiasian marsupials that preceded Cook’s visit. The earliest European evidence of Australia? We know that the Dutch, Portuguese, Spanish and French had been sailing the west coast of Australia for some time on trade routes out of the Dutch colony in Batavia (Jakarta), though it’s hard to pinpoint exactly when that started, possibily because such knowledge would have been protected trade secrets. There are maps from 1566 produced by Frenchman Nicolas Desliens; and by Flemish explorers Gerard and Cornelis de Jode in 1578 which appear to include Australia’s northern shore, and its rough position relative to New Guinea (which was known in the 16th Century by the Portugese). We have no evidence that they landed. The earliest European evidence of Australian mammals? 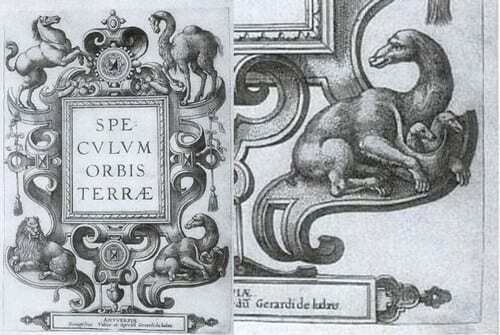 Is it possible the animal in the bottom right of Cornelis de Jode’s 1593 Speculum orbis terrae is a marsupial? It is enlarged on the right. The odd animal on the bottom right (in the relative geographic position of Australia, compared to the horse of Europe, the camel of Asia and the lion of Africa) is shown with babies in a neck bag, or a pouch. It is not described but this could be the first Western depiction of an Australian animal, and indeed a kangaroo, potentially based on sailor’s descriptions after visiting the north coast. This also fits the theme of one of the ten UCL researchers who contributed stories to the Strange Creatures exhibition from their own disciplines: UCL History’s Misha Ewen explains that the first priority of an explorer encountering a new species was curing their hunger, not furthering scientific discovery. A tammar wallaby – the first Australian mammal to be described. 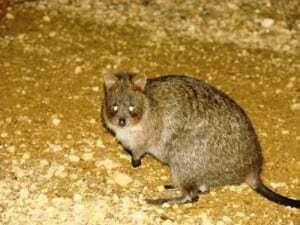 A quokka: one of the first Australian mammals to be described. 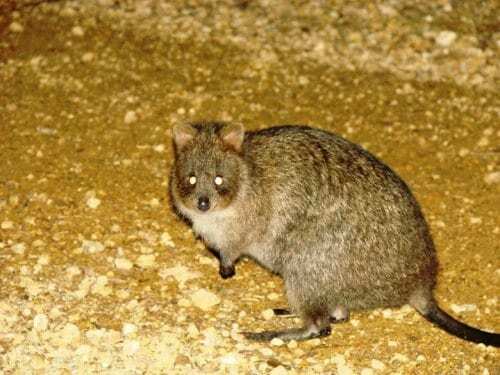 Later, two Dutch explorers encountered the now famous quokkas on Rottnest Island (off of modern Perth). First, in 1656 Samuel Volkersen described: “a wild cat, resembling a civet-cat, but with browner hair”. In 1696 William de Vlamingh gave the island its name (meaning “Rats’ Nest”, saying “of animals there is nothing but bush rats”. Nicolaes Witsen reported on the voyage: “[Vlamingh] found no people but a large number of rats, nearly as big as cats, which had a pouch below their throat into which one could put one’s hand, without being able to understand to what end nature had created an animal like this: as soon as it had been shot dead, this animal smelled terribly, so that the skins were not taken along”. The link with American opossums was not made then, but this is the first time the marsupialness of Australian animals is mentioned. Reading this now, it’s hard to predict how much the understanding of zoology would have been brought forward if the sailors had had less sensitive noses. For what it’s worth, my experience is that dead quokkas smell no more or less than any of their relatives. So Cook was neither the first European in Australia or the first to meet its mammals. He wasn’t the first Brit either. 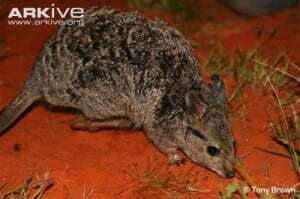 In 1699 William Dampier described banded hare-wallabies, on an island in Shark Bay (coincidentally where I was two weeks ago week, surveying the same, now Endangered, species): “The Land-Animals that we saw here were only a sort of Racoons, different to those of the West Indies chiefly as to their Legs; for these have very short Fore-Legs; but go jumping upon them as the others do (and like them are good meat)”. Again prioritising information about their edibility. Apart from the possible 1593 Strange Creature, to date none of these encounters had resulted in any visual representations of the animals, to really bring them to life for the people back home in the way that Stubbs’ kangaroo did later in 1772. A New Guinean dusky pademelon by De Bruign in 1711. the first confirmed European depiction of a macropod. 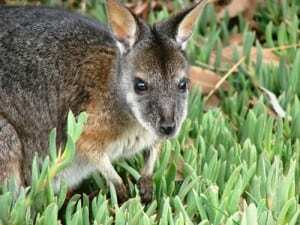 This changed in 1711 when Cornelis de Bruijn (Dutch) met a dusky pademelon in a Javan menagerie, brought from New Guinea. 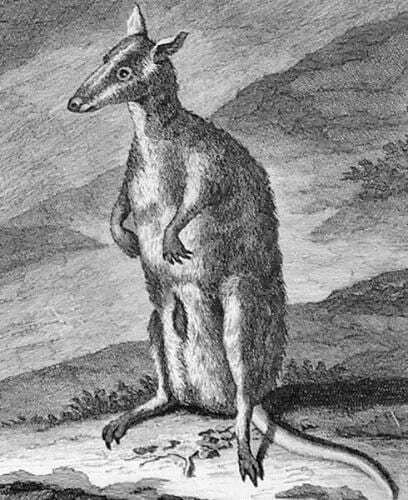 He produced the first confirmed illustration of a hopping marsupial, and it even shows the pouch. But as it’s not a kangaroo, or Australian, or a painting, we are safe in our claim that Cook’s voyage produced the first depictions of kangaroos, and Australian animals, for a European audience. 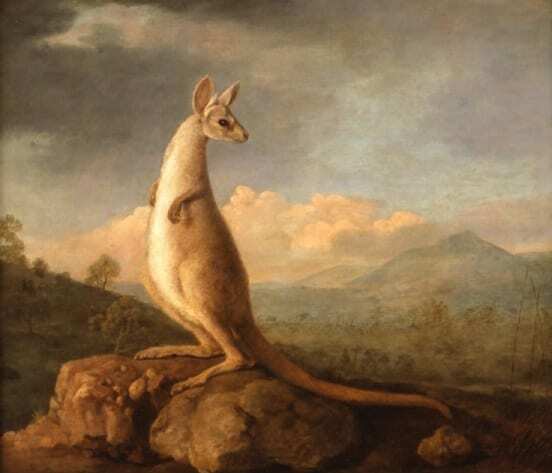 What’s interesting is that although Cook, and the legendary naturalist with him, Joseph Banks, almost certainly would have read descriptions of previous voyages around New Holland, they didn’t relate any of their observations of kangaroos to the animals previously described. Reading those describitions, though, that isn’t very surprising. The absolute oddity, to an eightheenth century explorer, of a hopping marsupial was clearly beyond their descriptive ability. The constant comparisons to cats, dogs, rats and raccoons inevitably led to their discoveries being more or less ignored. That is, until Cook wrecked the Endeavour on the Great Barrier Reef and brought the kangaroo to Europe, in the form of Stubbs’ fantastic painting. ‘Strange Creatures: The art of unknown animals’ runs from until 27th June 2015. The Grant Museum of Zoology is open from 1–5pm Monday to Saturday. Admission is free and there is no need to book. Jackson, S & Vernes, K 2010, Kangaroo: portrait of an extraordinary marsupial, Allen & Unwin, Crows Nest, N.S.W. Whitley, G 1970, Early history of Australian zoology, Royal Zoological Society of N.S.W. Thank you Jack for this fascinating account, I would love to see this exhibition and particularly the Stubbs painting. You can see Stubbs’s struggle to relate the kangaroo to something more comprehensible to his western eye. 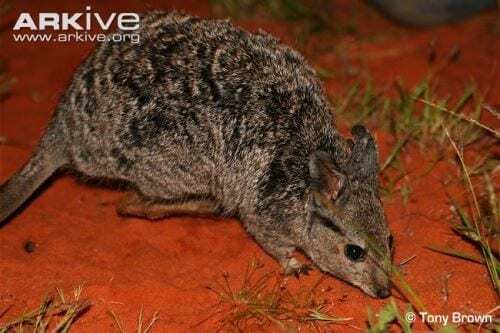 The large eyes, erect and rounded ears and, above all, the tail – plainly here not used as a counterweight and support as in a kangaroo – all contribute to the impression of a kind of gigantic mouse. Like Stubbs, I remember my brain settling on a comfortable comparison of the muzzle of a Grey Kangaroo as being dog-like the first time I saw one in the flesh. however I suppose the closest we can come to Stubbs’s experience of a creature so ‘new’ is by watching a documentary about the more outre deep-sea creatures. Keep it up Grant Museum! We love you.